That’s right, MARS: the Mid-Atlantic Regional Spaceport, located on Wallops Island in Virginia. The Wallops Research Range is America’s oldest continuously-operating rocket launch range. It’s been around for more than 60 years and has supported more than 16,000 flight events. The spacecraft — consisting of an ATK Space Systems satellite bus and Tactical Satellite-3, which carries a trio of experiments — will be taken into space by an Orbital Sciences Corp. Minotaur I rocket. The four-stage rocket includes two taken from retired Minuteman intercontinental ballistic missiles and two from Orbital’s Pegasus booster. "Obviously, the project has much to do in these next few weeks leading up to lift off, but we now have a firm end date to get on orbit and begin the fun experiment phase," TacSat-3’s program manager Thomas Cooley said about problems encountered earlier in the project with some of the spacecraft’s components. The main experiment aboard the satellite, ARTEMIS HSI, was developed by Raytheon Co. It is designed to quickly supply military commanders in the war theater with target detection and identification information, along with information about battlefield preparation and combat damage. 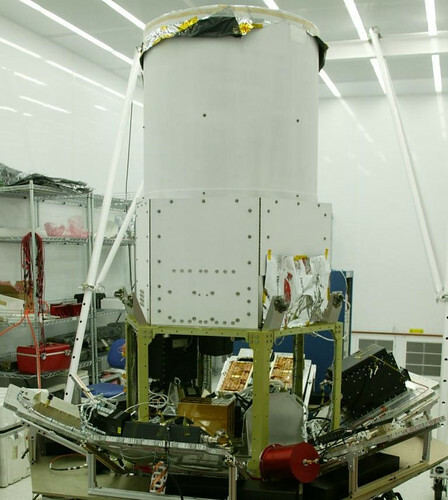 A second payload on TacSat-3 is the Office of Naval Research’s Satellite Communications Package, which will collect data from sea-based buoys and transmit it back to a ground station. A third experiment, the Air Force Research Laboratory’s Space Avionics Experiment, is described in a prepared release from the Air Force as "plug-and-play avionics to advance the technology of rapid spacecraft integration and help enable the responsive space vision." All three payloads have been tested at Kirtland Air Force Base in New Mexico and final checks of the flight software have been completed in preparation for the May launch. "Our program team never gave up, and establishment of the launch date serves as a testimony to their dedication, determination and duty to making TacSat-3’s mission a success,” Cooley said. The spacecraft is now at MARS, where it will be joined with the launch vehicle. Expect the launch to be webcast here. This entry was posted on Tuesday, April 14th, 2009 at 6:25 am	and is filed under Around the Blogs, Business Network, Observation, Rockets & Launches, Satellite TV. You can follow any responses to this entry through the RSS 2.0 feed. You can leave a response, or trackback from your own site.